See the best-selling and most popular gardening hand tools used by gardeners like you. Take a look. How can you know if your tomato plants need to be pruned? Many successful tomato gardeners never pick up a pruning clippers. Use these tips to know if pruning tomatoes in your garden will give you more tomatoes, bigger tomatoes, and more flavorful tomatoes. Your plants are indeterminate tomatoes. Indeterminates continue to grow until frost. Pruning tomato suckers on indeterminates helps produce healthier, tastier, more abundant fruit. Lower leaves are yellow. Pinch or prune yellowed leaves to prevent disease, improve the tomato plant’s appearance, and help the plant keep its energy focused on fruit production. Your tomatoes are staked. Staking and pruning go hand in hand, as both allow leaf tips to be open to the sun without excess stress, leading to stronger, more flavorful fruit. Your plants are determinate tomatoes. Determinates produce a limited number of fruit before ceasing production. Avoid pruning tomato determinate varieties or pinch back only suckers that appear below the first flower cluster, or you will reduce your yield. You live in a hot climate. Pruning opens up the plant and fruit to more exposure. Too much sunlight or steady, intense sunlight can lead tomatoes to develop sunscald. Your tomatoes are not staked. Suckers are difficult (nearly impossible) to identify in sprawling plants. 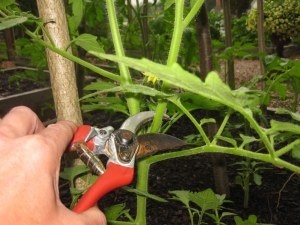 … and see how-tos on our Pruning Tomatoes Pinterest Board.